Former international Sang Ndong has been named as the coach of The Gambia again, his last stint ended in 2003. He has stepped down as coach of local side Hawks to sign a two-year deal with the Scorpions. Ndong's first competitive games will be home and away 2017 Africa Cup of Nations qualifiers against Mauritania in March. "Our objective now is to rebuild. We're not saying there's nothing on the ground - there is," he said. "But we want to take it from where it is, to another level and to change, not the brand the national team is using, but the face of the national team, how we see our national team." 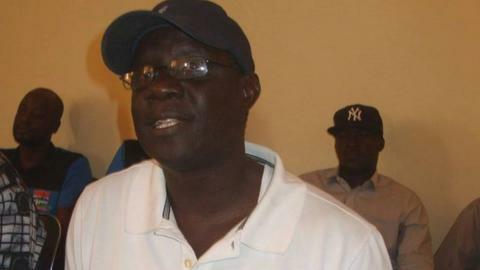 Ndong has spent time as technical director with The Gambia Football Federation and has stepped in as interim coach of the Scorpions on several occasions in the past. "Coaching the national team is the easiest job one can do here BUT looking into the problems of the national team is where experience and knowledge, support, motivation matters," he added. "I accepted this position for the simple reason that I am a Gambian, I am a coach. "I want to help set the standard for Gambian coaches, for us to be recognised - to be respected to be given the opportunities and to be supported." He replaces Swiss coach Raoul Savoy who left in December, when his contract was ended by mutual consent. The Gambia are currently third in their Nations Cup qualifying group with one point from a 0-0 in South Africa, they then lost at home to Cameroon 1-0.